The Changeable Lettering Sidewalk Springer Sign features struts and a water-fill base to help prevent this versatile sign from blowing away. Advertise with this fully customizable and professional looking display. 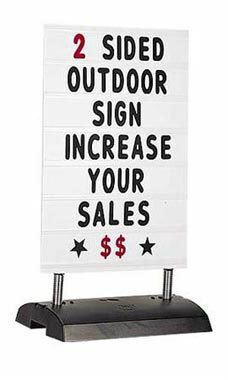 The Changeable Lettering Sidewalk Springer Sign features double-sided changeable sign panels, each measuring 36”H x 24”W with 7 interchangeable lines. The sign includes 314 black and red 4” letters, numbers, and symbols.